A highly-skilled firefighter based at Rushmoor station has been deployed to Bangladesh to assist medical teams as they battle to save thousands of lives following a deadly diphtheria outbreak at refugee camps, theGet Surreyhas reported. 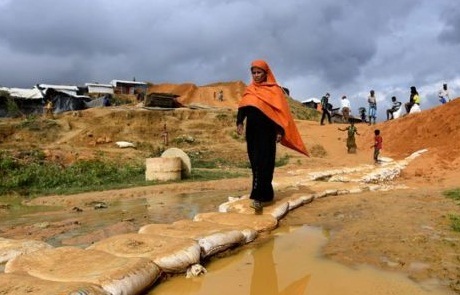 More than 20 deaths and 2,000 suspected cases have already been confirmed, with 160 new cases a day being reported in tourist city Cox’s Bazar – currently home to around one million displaced people fleeing violence and military persecution in Burma. After a request by the World Health Organisation and the Bangladesh government, UK International Search and Rescue (ISAR) began assisting with treating and immunising people against the airborne virus. Simon Forster, watch manager of the Urban Search and Rescue team at Hampshire Fire and Rescue Service, will provide logistical assistance for the UK’s Emergency Medical Team in its first deployment since it was certified by WHO in 2016. “It is hard to know what the conditions will be like so it is best to keep an open mind – it is hard to imagine temporary hospitals being built out of bamboo and a refugee camp that is 20 square kilometres,” he toldGet Surreyreporters. The 44-year-old is one of five firefighters on the 40-strong team and will be organising the transport and setting up of equipment, creating infrastructure, communications, route finding and navigating as the medical teams travel between the refugee camp and two settlement camps, and operating a roving unit. He was previously deployed to Nepal in 2015 following the earthquake which killed around 9,000 people and injured 22,000, theGet Surreyreport said.